Receive a complimentary charcuterie board when you make a booking for 10 people or more. 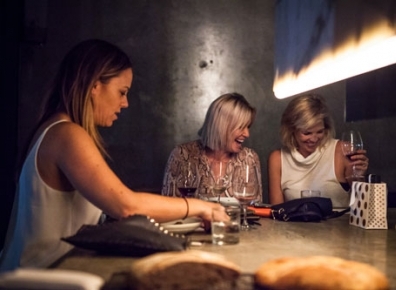 A perfectly positioned neighbourhood bar, just off James Street and the hustle and bustle of this stylish precinct, Gerard’s Bar & Charcuterie is a gem that grew out of the concrete and a destination with much to offer. Perfect for engagements, farewells, birthday parties, corporate events and gatherings, we invite you to join us at Gerard’s Bar for your next function in one of our unique spaces. Boasting a carefully curated cocktail menu and progressive list of wines, an impressive selection of cured meats and cheeses complimented by friendly staff and full table service – Gerard’s Bar is a venue that welcomes you to come for a drink and maybe stay for the evening. Situated at the back of the venue and close to the action of the kitchen, the Chef’s Table is ideal for a dinner gathering of up to 8 guests, sampling our renowned charcuterie and carefully curated snacks and tapas. Tucked neatly in front of the bar in the middle of the venue, the Alcove is suited to a small gathering of up to 8 guests to share cocktails and charcuterie in a secluded setting. Enjoy table side service while taking in the action of the bar or enjoy the privacy of your own little space. The Side Deck is furnished with a combination of high and low seating, as well as a semi enclosed space to feel secluded but part of the action. Perfect for small cocktail parties and corporate events, the Side Deck offers ample space to perch and enjoy the company of friends, conversation with colleagues and to network and mingle with new acquaintances. Seated around our fairy light lit tree in true James Street style, the Deck is a crowd favourite at Gerard’s Bar. Sit back, watch and be seen in the most iconic of James Street locations to sip away the hours with your closest family and friends. Mingle over a range of delicious snack options and sip cocktails as you celebrate your next event. Please everyone with our incredible share boards. With 4 options available, there's something for everyone to enjoy. Pick and choose a range of gourmet imported cheese and salumi. Serving the highest quality charcuterie ingredients, you will be sure to impress any guests. Design a free flowing premium beverage package. With handcrafted cocktails, boutique beers, wines and spirits. © Gerard's Bar. All Rights Reserved. If you would like to host your next function or event at Gerard's Bar, please complete the form below and a member of our team will be in touch with you.